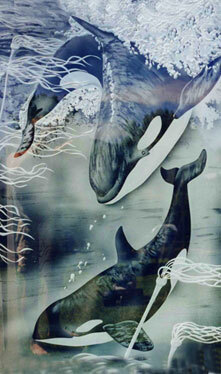 Welcome to Crawford Etched Glass, and the works of glass artist, Paul Crawford. Decorative glass is a versatile medium that combines the intrinsic beauty and texture of glass with the natural wonderment of light. The appearance of the glass is changed through the processes of sandblasting, etching, carving, or sculpting to produce timeless pieces of art that are as functional as they are beautiful. Learn more about the versatility of decorative glass, and the imaginative ways that Paul’s work brings glass to life in business and home décor, signage, and corporate awards. Crawford Etched Glass is a home based studio by appointment to art glass commission clients. The studio is located in Fanny Bay, in the Beautiful Comox Valley on Vancouver Island, BC. Whether your tastes prefer the simple or elaborate, decorative sandblasted glass is a beautiful and versatile medium that can transform or conform to your existing home décor. Thanks to the timeless aesthetic appeal of glass, any room can be transformed by redirecting the dynamics of light, creating innovative ways to accent your tastes. You can even submit your own design ideas for personalized pieces that coordinate perfectly with the rest of your business or home décor. Get inspired! Visit the rest of our site and let us know how we can bring your ideas to light, with the addition of custom etched and sandblasted glass art.